Like the idea of Casio's Pro Trek WSD-F30 adventure watch on your wrist, but don't think it's the right look for you? The brand is releasing a new design that you may like...but it's goingt to be difficult to find. The Casio WSD-F30SC has just been announced at Baselworld 2019, and it features all of the same features of the original watch unveiled last year. Where it differs is the design: it has rose gold buttons and a deep blue bezel with a lined effect. It's also smaller than the original watch at 53.8 x 49.1mm compared to the standard watch's 57.7 x 52.9mm dimensions. It also comes with a metal chain link band - that you can see in the photos below - as well as a stainless steel rear that sits on your wrist. Trying to find this watch may be difficult when it launches in June this year. Considering the watch in the image at the top of this page says "Sunday June 30", it may be the company begins selling it toward the end of that month. 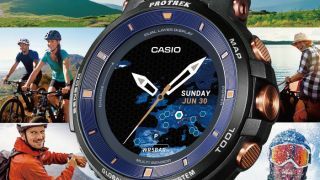 Casio told TechRadar the watch would be available in Japan and Europe, but it won't be on sale in the US. Casio isn't even sure if the UK will be one of the markets it's on sale. Even if it is, it may be a bit of a scramble to find one as the company only plans to release a thousand of these limited edition watches. It's more expensive than the original watch too, with the pricing we've been given coming in at 100,000 Japanese yen. A loose conversion of that means the watch is around $900, £700 or AU$1275. That'll be quite a mark up considering the original watch is currently on sale around the world at $550 (£449, around AU$900). The Casio Pro Trek WSD-F30 offers GPS, a dual-layered display to improve battery life and Wear OS software to make it one of the more useful smartwatches around, although its original rugged nature made it more niche in appeal - let's see if a fancy redesign can inspire more desire.